Coiled cables are used by many industries, medical, industrial controls, aerospace, public safety and telecommunications. Regardless of the industry coil cords are used because they extend. This ability to extend allows a coiled cord allows connections between devices where one device or the other moves. Having the ability to extend means coiled cables are much better solutions in dynamic applications than a fixed wire harness, which can fail easily in these environments. Since coil cords are a dynamic component in any system testing their ability to withstand repeated extensions and retractions is critical. Meridian Cable, a leading coiled cable designer and manufacturer, has been designing, manufacturing and testing coiled cords for over 30 years. Recently we designed, manufactured and tested a 23 gauge, 7 conductor, polyurethane jacketed, medical coiled cord for repetitive extension fatigue. The cable used to make the coiled cord tested was designed by Meridian Cable with the following elements. The 23 gauge conductors were each composed of 21 strands of tinned copper with each strand having a diameter of 0.127mm. Each wire was insulated with polypropylene and had an outside diameter of 1.28mm. Finally 7 conductors of 23 gauge each were bundled together and polyurethane was extruded over the bundle. The raw cable was then made into a coiled cable. To see a video of this process go to our coiled cable video at Meridian Cable’s YouTube channel. To make a coil cord the raw cable is wrapped around a metal rod, put in an oven for heat treating and then removed from the rod. Once the coil cords were complete Meridian Cable tested them using our custom testing machine that extends and retracts the cable continuously. The electrical and mechanical integrity of each unit is monitored continuously too to determine the exact point of failure. Also, after a set number of cycles the coiled cable is removed from the test machine and its new state is measured and compared to its original mechanical specifications. The testing process is quite simple actually, but does require custom equipment. The coiled cables are attached to a machine with two arms. One arm is fixed and the other moves up and down. Meridian Cable has several of these machines since we make coil cords with extension lengths from a few inches to over 30 feet! Each cable is connected to electrical test equipment to determine the exact moment any failure occurs. If a failure happens then the test is automatically stopped. The test equipment has a counter to count each cycle, so when that machine stops we know the precise number of extensions and retractions the coiled cable has experienced. 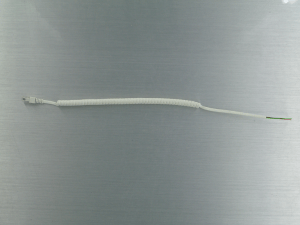 This medical coiled cable passed 400,000 cycles without failure! As you can imagine and medical coil cord or cable assembly must be able to function without failure, and this coil cord designed and manufactured by Meridian Cable exceeded specification by over 4 times! While wire harnesses are great, certain applications demand a cable that can extend and retract, without failure. And as our data is proving we make a coiled cable that can live up to a demanding environment. Should you need a standard coiled cable or a custom design coil cord Meridian Cable can help. Meridian Cable has over 30 years of experience designing and manufacturing coil cords, coiled cables and cable assemblies. Designed – Built – Delivered, Meridian Cable is ready to help create a solution for you.